WBL is bassically Mountain with a heavy shot of Cream in it, courtesy of Jack Bruce. 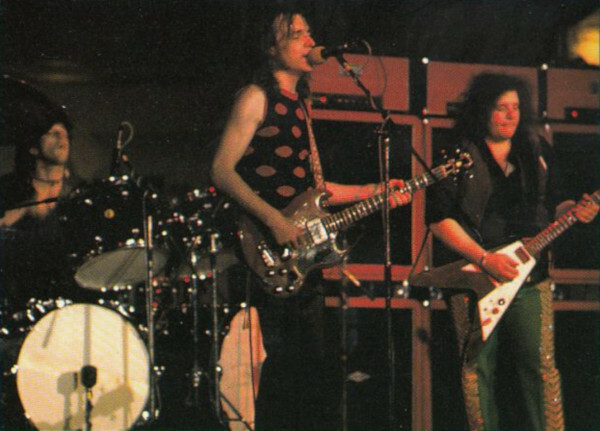 When Mountain crumbled, Leslie West and Corky Laing asked Jack to join them in a new venture. The resulting power trio garnered a good amount of attention from the press and had a Top 40 hit with their first album, Why Dontcha. That album featured songs from West and Bruce, and ended up sounding like half a Jack Bruce solo album and half a Mountain album fused together. The songs on the second album, Whatever Turns You On, were credited to the whole group, which likely had more to do with revenue sharing than a shared musical vision. The record didn’t chart as well as their first, and the trades quickly began to speculate whether the group was finished. By the end of 1973, WBL was officially over; a posthumous live album, Live ‘N’ Kickin’, was released the following year. Why Dontcha / Out Into The Fields / The Doctor / Turn Me Over / Third Degree // Shake Ma Thing (Rollin’ Jack) / While You Sleep / Pleasure / Love Is Worth The Blues / Pollution Woman. Released on elpee and quadrophonic elpee in November 1972 in the US (Columbia/Windfall, KC/CQ-31929) and the UK (Epic, S65314; reached #26 on the US charts. Re-issued on elpee in Australia and Germany (RSO, 2394 101) and in France (RSO, 2479 111). Re-released on remastered compact disc in 2007 in Germany (Repertoire). Re-issued on compact disc in 2008 in the US (SBME Special Markets). b/w Shake Ma Thing (Rollin Jack), Why Dontcha (GER). Released on 7-inch in 1973 in the US (Columbia, 4-45751), Germany (RSO, 2090 103) and Japan (RSO, DW 1071) with picture sleeve. Also released as promotional 7-inch in 1973 in the US (Columbia, 4-45751) featuring A mono on flip side. b/w The Doctor. Released on 7-inch single in 1973 in France (RSO, 2090 103) and Mexico (Polydor, 11). Re-released with “Mississippi Queen” on backt-to-back hits 7-inch single on March 30, 1973 in the US (Columbia, 4-45829). Backfire / Token / Sifting Sand / November Song // Rock ‘n Roll Machine / Scotch Crotch / Slow Blues / Dirty Shoes / Like A Plate. Released on elpee and 8-track in July 1973 in the US (Columbia/Windfall, KC/18C 32216), the UK, Australia and Germany (RSO, 2394 107) and Japan (RSO, MW 2072); reached #87 on the US charts. RSO elpees feature different back cover artwork. Japan elpee includes poster. 8-track features different track order. Re-issued on elpee in France (RSO, 2479 112). Re-issued on elpee in Japan (RSO, MWX 4041). Re-issued on compact disc on March 1, 1992 in Japan (Polydor, POCP-2170). Re-released on remastered compact disc in 2008 in Europe (Esoteric, ECLEC 2075). b/w Dirty Shoes. Released on 7-inch in 1973 in Germany (RSO, 2090 113). Live tracks: Play With Fire / The Doctor // Politician / Powerhouse Sod. Released on elpee, cassette and 8-track in April 1974 in the US (Columbia/Windfall, KC/CA 32899), the UK (RSO, 2394 128/3216 028) and Japan (RSO, MW 2091); reached #165 on the US charts. Re-issued on compact disc in West Germany (Polydor, 841 038-2). Re-issued on compact disc in 1992 in Japan (Polydor, POCP-2171). Re-issued on compact disc on August 25, 2008 in the UK (Esoteric, ECLEC 2072). Re-released on remastered compact disc in 2013 in the US (Culture Factory).